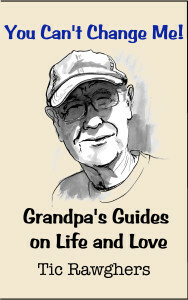 Grandpa Tic Rawghers, author of the Grandpa’s Guides series, has come out with his first book in print! We are excited to announce the availability of You Can’t Change Me! 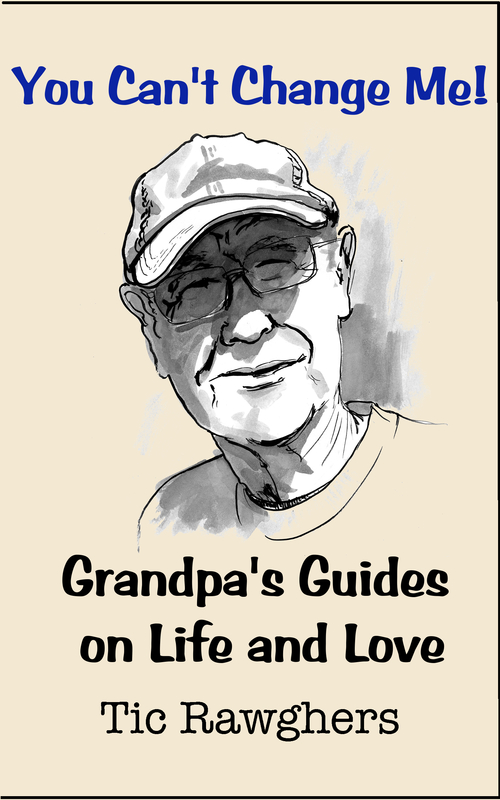 Grandpa’s Guides on Life and Love, available now in paperback and ebook formats. This book encompasses all 4 of Tic’s guides, as well as a small bonus section where he explains some of the mysteries of life. How was this possible? He first completed his 4th guide, There’s Nothing to Do! on Kindle available here. This guide is on Summer Vacations. 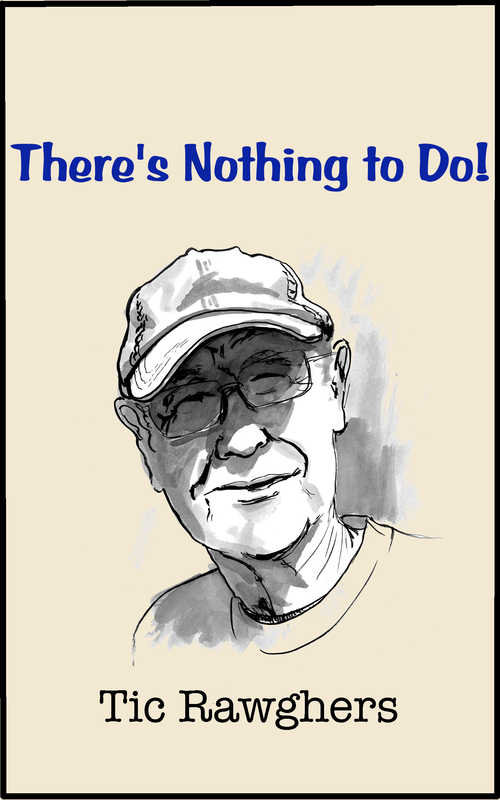 If you’ve heard kids complain right after they’re out of school, well, Grandpa Tic has some suggestions to make their summer vacation an unforgettable one. Filled with his wit and wisdom, Tic shares some snippets from a summer vacation he took that he still remembers to this day as he explains things to his grandkids and his kids. This guide will be a FREE download Friday and Saturday, 2/20-21. Or, you can buy the print book and get the entire collection in Kindle format for only 99c! This offer is available all the time. 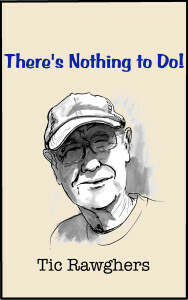 Tic will be signing and selling his book at the Gulfport Art Walk on the first Friday in March, 3/6/15. Come see him at a booth along the walk – the location will be known later. 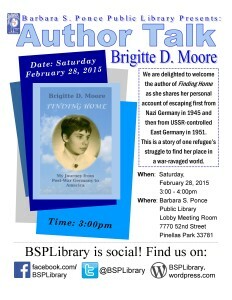 Brigitte D Moore, author of Finding Home, will be signing at the Barbara Ponce Library in Pinellas Park. Here are the details in a flyer promoting the event. She has a fascinating story and would love for you to come out and listen and ask questions. When: Saturday, Feb 28, 2015 from 3:00 to 4:00 PM. We hope you can join her. This compilation includes episodes 12 to 16 in the series. It follows the detective as he attempts to prevent the zombie apocalypse from becoming a reality. It looks like one state has pretty much turned, and it’s his state, which was ground zero. Filled with action, humor, romance, mystery, and of course, zombies, the twists and turns will keep you on the edge of your seat. Enjoy! 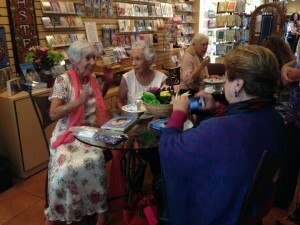 This is a busy time for author appearances. We have 3 coming up in the next month, all occurring within a week of each other. 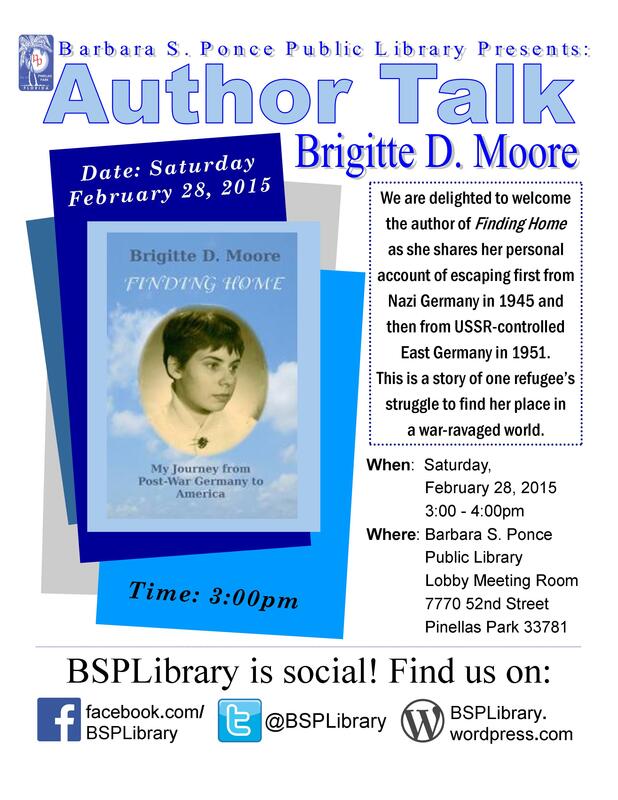 Brigitte D. Moore will be giving a book talk at the Barbara S. Ponce Public Library in Pinellas Park on Saturday, Feb 28, 2015 in the afternoon. One of our most popular authors continues to make sales and spread the word about her personal story. j gerard michaels will be at the 5K Zombie Run in Largo, FL on the same day, in the morning. You could actually make both events! This one is a fun family affair, with children of all shapes and sizes enjoying exercise and the outdoors. The author will have some goodies to give away as well. Bria Burton will join j gerard michaels at the Gulfport Art Walk in Gulfport, FL (southwest of St.Pete) on Friday, March 6, at a booth selling their books. I’ll be there as well promoting Soul Attitude Press. This is another great event that we’re happy to be a part of. Brigitte Moore is making the rounds of America talking about the experiences that led to her book: Finding Home. Earlier this summer she was at the Amagansett Library on Long Island. You can read all about her presentation here. She is still looking at ways to share her story – you can contact her on her website, and is preparing to write the next chapter in her life. Brigitte Moore held a book signing at the Wings Bookstore in St. Petersburg last Sunday, 1/5, and absolutely rocked the place. The line (which I heard about but didn’t witness) was long and she sold sixty books! 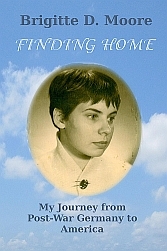 Her book, Finding Home: My Journey from Post-War Germany to America, has been well-received both on her Internet sales as well as her local signing. 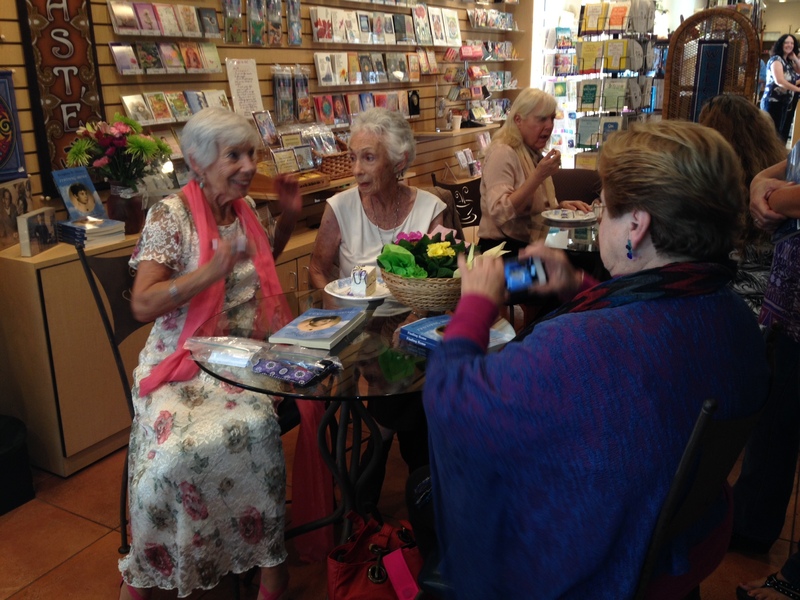 Brigitte at a table discussing the writing process with friends at Wings Bookstore. We wish you the happiest holidays this year, and thank you for all you’ve done for us. Our little venture really took off this past year, after ‘resting’ the first couple of years, as we published 7 new titles in paperback (+1 assisted), and over a dozen ebooks (a mix of short stories and full-length books), in an eclectic mix of genre’s: memoir, spirituality and faith, and horror/humor:zombies. We hope next year will see continued contributions to our readers and authors, and soon-to-be authors. Our misson: to provide you with a good read, an inspirational lift, laughter, and the thrill of holding that first book in your hands. 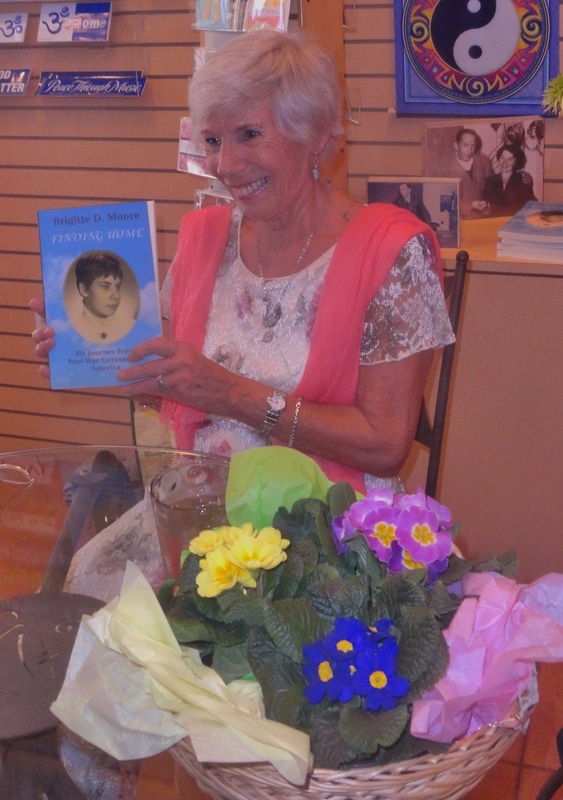 at Wings Bookstore – corner of 45th Ave and 4th St N in St. Petersburg, will be signing her new memoir: Finding Home. Brigitte Moore’s story of growing up after the war and immigrating to America is a compelling story of survival in war-torn Germany, detailing many of the hardships of growing up during that time. Soul Attitude Press will share a table with one of our authors, Bria Burton, offering our books for sale and also doing a reading or two from our selection. We are excited to be a part of this new 2-day FWA event, the first ever open to the public (for the reading festival). Bria’s new book is now available in paperback as well as ebook format. Her compilation includes a never-released story as well as those previously offered on the Kindle, a total of 10 ‘Tails’ in all. 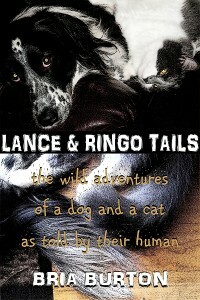 For the pet lover and anyone interested in good, humorous, family entertainment. We hope your holidays are filled with joy and love, and that you carry this spirit with you every day, not just on special occasions. 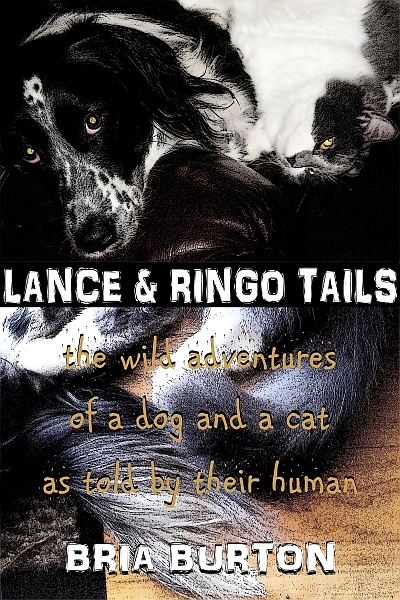 Bria Burton, author of the Lance & Ringo Tails series, has released the ebook and paperback compilation of the first 10 stories (the first 9 having been released as singles), and you can find it on Amazon here (paperback) and here (Kindle), and CreateSpace here. What a journey it has been for Bria as she worked through the layout software, learning new skills and the intricacies of CreateSpace. Brigitte D. Moore, our current bestselling author, is having a book signing at the Wings Bookstore on the corner of 4500 4th St N in St. Petersburg on Sunday, January 5th, from 2pm – 4pm. She will be signing her debut memoir, Finding Home, My Journey from Post-War Germany to America. It’s available on Amazon here. Stop by and give a shout to this wonderful lady! It’s with great excitement that I announce two new books now available from two very different ends of the writing spectrum. One is from one of our long-time authors and one from a brand new one. First, welcome Brigitte D. Moore, who’s memoir is now available on CreateSpace here, and will be available on Amazon here late this week or early next. Her cover is shown on the books page. Her book spans her life up to age 21, when she immigrated to America, and brings to vivid life the hardships endured by people caught in the post-WW II tension between East and West. 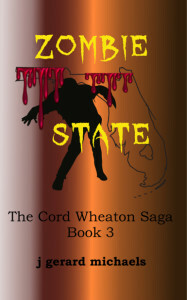 The second full-length book from Mr. Michaels is a compilation of episodes 8 through 11 of his ebook series, The Cord Wheaton Saga. This set of episodes races through the action as the detective fights to save his own life, and the life of the girl he loves. 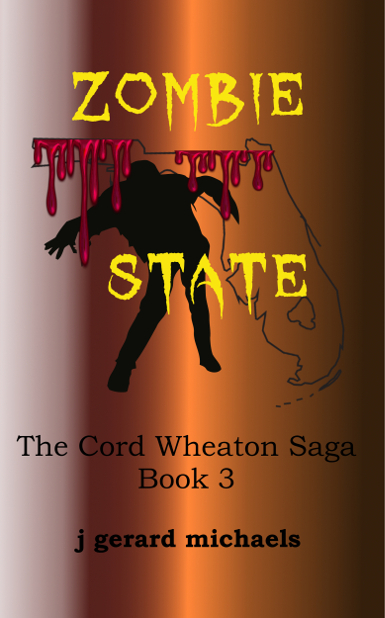 Set in Florida, the action takes place between St. Petersburg and Tallahassee as the zombie problem spreads across the state. You can visit his website for more information or to follow him. All told this year, Michaels’ has come out with 2 new books and 7 ebook episodes. We can’t wait to see where this story turns next! Note: This post will be updated once the Amazon links become active.